One of the most perplexing art theft mysteries has finally been solved, thanks to the keen eye of a professor at the University of South Carolina Upstate. The theft took place in 2003 in South Carolina at an estate in the countryside named Hobcaw Barony, and while it didn't excite much notice at the time, it was featured on a 2013 episode of the popular show 'Antiques Roadshow'. The missing pieces included a painting by renowned English artist Sir Alfred Munnings, a famous equestrian painter and an incredibly outspoken critic of the Modernist art movement, entitled Bell on Souriant, which was valued at over $1 million USD. That wasn't the only piece that went missing, however - there were also some original folios painted by the famous naturalist John James Audubon from the series 'Birds of America', valued between $45,000 and $80,000 USD. 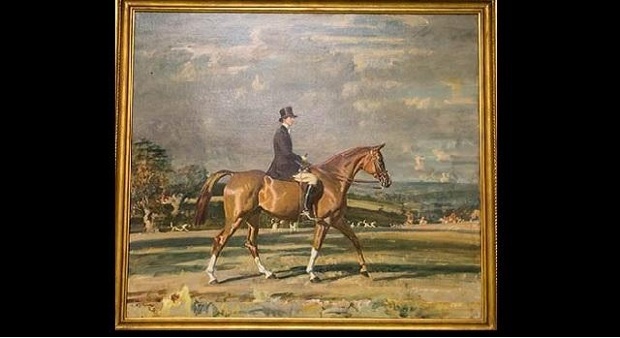 Professor Frazer Pajak immediately recognized the piece by Munnings as the work stolen 13 years ago, after being asked to consult on a lot of pieces that had been acquired by John Allen Ivy of Ivy Auctions, a local South Carolina auction house. The painting and prints were part of a collection they had received from the estate of a deceased wealthy Colombian collector, although there was little information as to how they wound up in that collection. The 17 prints and paintings went missing in 2003 as part of a larger heist originally reported by Samuel McIntosh, who had just retired as the curator of the Hobcaw Barony collection. He fell almost immediately under suspicion of the thefts, and several of the missing pieces were discovered in his home, but the recently rediscovered pieces stayed missing for the last 13 years. "We were relieved and happy because we never lost hope that our paintings would be seen again. These pieces help tell the story of Hobcaw Barony,” said George Chastain, the executive director of the Baruch Foundation, which owns Hobcaw Barony. “Their theft left a hole in our history. Thanks to the assistance and persistence of Matt Jacobson of the FBI’s Greenville office and Assistant United States Attorney Rhett DeHart, they will be restored to their rightful place, both physically and narratively." Unfortunately some of the pieces were found to be in bad condition, but technical and forensic experts hope that they will be able to be successfully restored to their original glory.